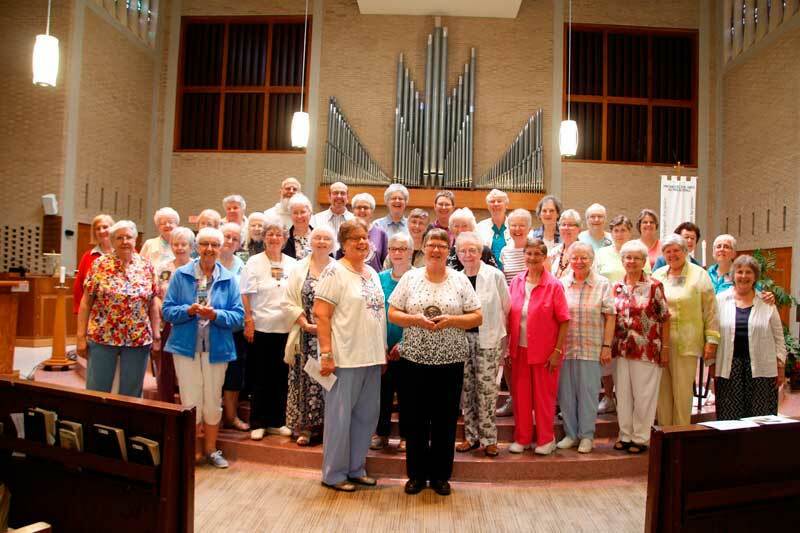 Racine, WI (July 26, 2016) – Celebrating 800 years and the Spirit flowing, Dominican artists assembled July 26-31 at the Siena Retreat Center, Racine, Wisconsin for the Annual Gathering of the Dominican Institute for the Arts. The DIA is an organization dedicated to promoting the preaching mission of the Dominican Order through the arts. The event opened with the projection of the DIA Virtual Gallery honoring the memory of those who had died and then exhibiting the works of its members in painting, sculpture, photography, poetry, liturgical design, videography and other arts and crafts. 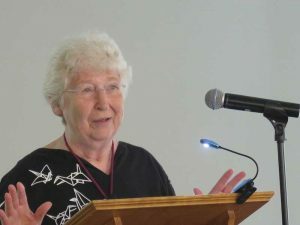 Barbara Cervenka, O.P. a nationally acclaimed Adrian Dominican artist, presented “Reflections on a Dominican Artist: Fra Angelico.” She highlighted the media and technical aspects of his works. Hands-on workshops in many art forms and a visit to the Ecojustice Center. There was discussion of collaborative projects, and sharing of inspiration from members’ artifacts, and entertainment. 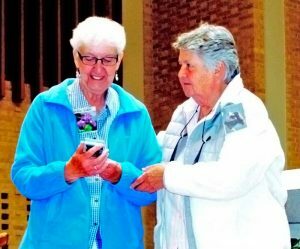 Mary Pat Reid OP presented the Spirit of the DIA Award to Barbara Kukala OP of Racine for her generous service. 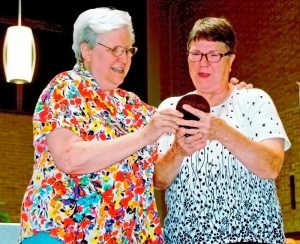 President Barbara Schwarz presented the Fra Angelico Award to Elizabeth Slenker OP, a Sparkill Dominican from St. Louis. The Fra Angelico Award is presented annually to a member for outstanding professional achievement and dedication to preaching through the arts. The Gathering included election of three board members to round out the DIA Board: President, Barbara Schwarz, OP; Amityville; Vice President, Pat Daly, OPA, Dominican Sisters of Peace; Secretary, Rudolf Lowenstein, London Province; Treasurer, Joella Miller, OP, Adrian; Membership: Mary Pat Reid, OP, Caldwell and Ann Marie Santen, OP, Sparkill; Elizabeth Michael Boyle, OP as members at large. The Gathering refreshed the membership with new inspirations, laughter and shared insights. The Spirit was truly flowing through its artists.